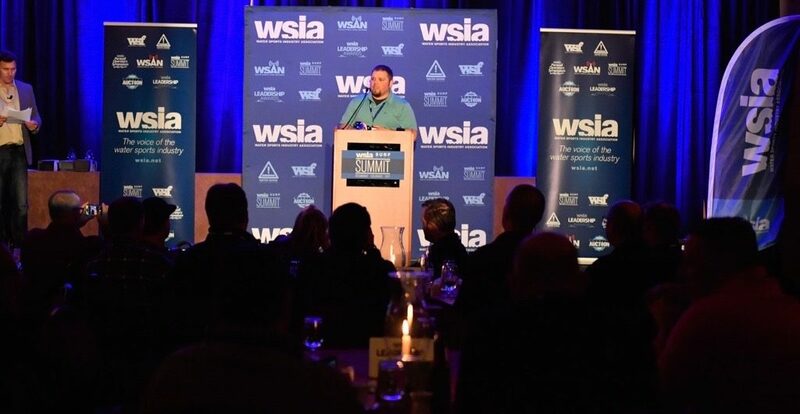 The 2017 WSIA Summit wrapped up on March 3 with the Leadership Awards, a ceremony that recognized industry leaders and top performers for the year in front of 185 attendees. 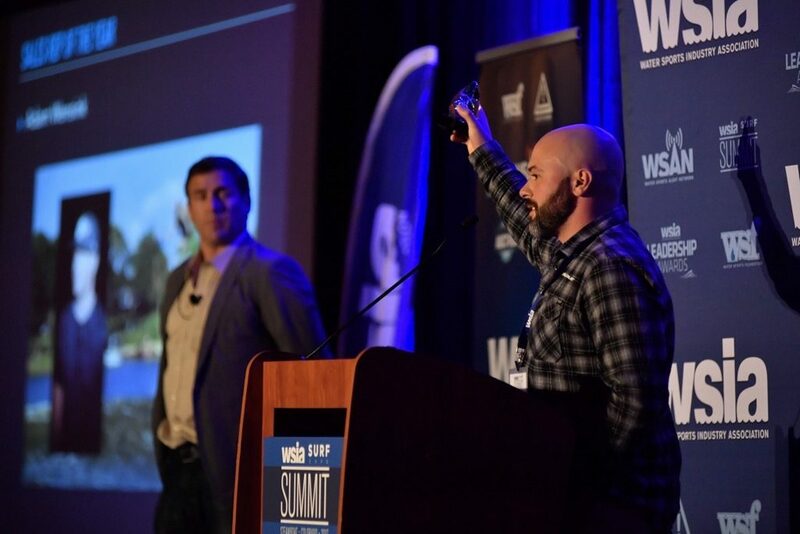 A highlight of the annual Summit, these awards honor the best in the towed water sports industry, on both retail and manufacturer levels. This accolade recognizes industry leaders and their products that push the towed water sports marketplace to new heights. 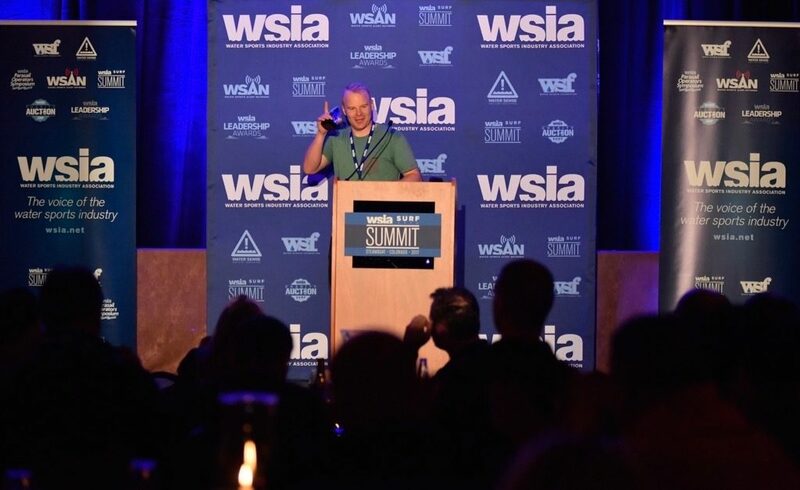 Each year, members of the WSIA cast their ballot on the seven award categories, and for 2017, WSIA members voted the Malibu Command Wheel as the winner. 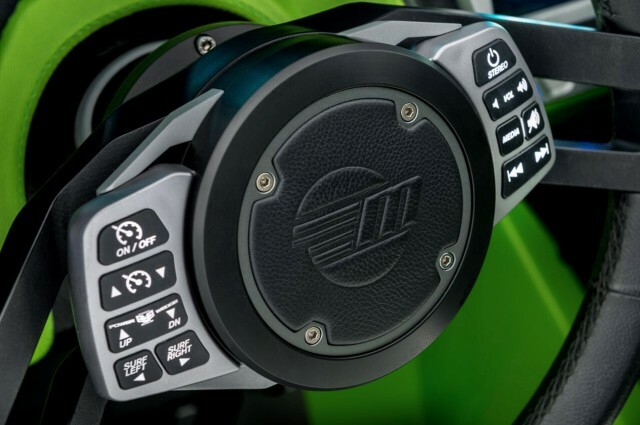 This innovation creates a user-friendly experience where the driver is always in complete control, ensuring a both fun and safe time on the water for passengers and participants alike. Products from various facets of the industry were nominated, and they all deserve a round of applause. But for 2017, the WSIA is pleased to honor Malibu as the recipient of this year’s award. 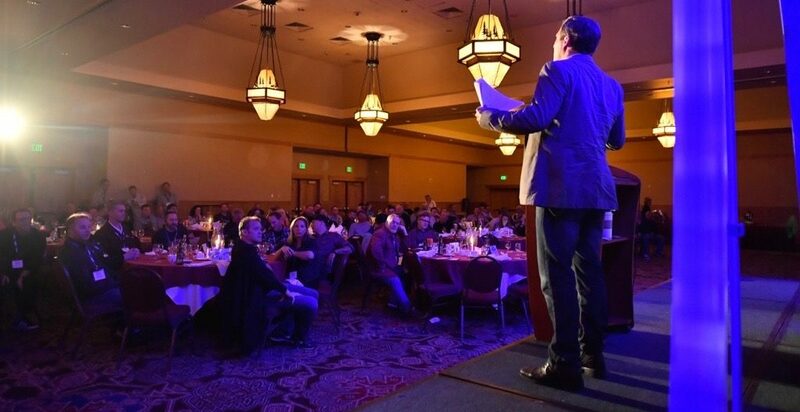 Consideration for this award focused on leading dealerships in the towed water sports industry that have a strong service department, an accommodating showroom for consumers, and merchandising that connects the consumer with what it’s really like to be a part of the towed water sports lifestyle. Dealerships are responsible for connecting the consumer and the manufacturer through sales, knowledge and commitment. Over the past year, Action Water Sports from Michigan did it better than any other. The third award of the night recognized pro shops that have distinguished themselves through outstanding product knowledge, creative displays, consumer enthusiasm and promotional ingenuity. These exceptional retailers go out of their way to support the contest scene, facilitate water sports clinics, work with community leadership groups, and grow the sport. This year, the voting narrowed it down to BoardCo at TSR in New Braunfels, Texas Customer service, product knowledge, and most of all, love for the sport are immeasurable in this location. This award honors the industry professionals who work tirelessly to educate both consumers and retailers, promote and represent their brands with the utmost enthusiasm, and make a strong impression on everyone they meet. These nominees go above and beyond expectations, and they’re doing it because they not only love the towed water sports community but also respect the opportunity to connect with partners. After Wensink received the award, Jeff Barton recalled, “I remember thinking to myself, ‘that guy is going to be successful at whatever he applies himself to,’ and we are very fortunate that he chose to apply himself to the towed water sports marketplace.” There’s no end to the amount of respect that the industry has for Wensink’s efforts. This next award recognizes the school or camp that offers multi-level training, knowledgeable staff and instructors, excellent amenities, and support for events, competitions and clinics. This year, Freedom Wake Park of Orlando, Florida, took home the top honor for their reputable facilities, including a private lake, System 2.0 with features, two boats from Malibu and Axis, and top-of-the-line equipment from O’Brien. The two head coaches of the park are Tarah Mikacich, one of the top pro-level women wakeboarders on the planet, and Cobe Mikacich, a legend in the world of wakeboarding. Cobe not only competed on the Pro Wakeboard Tour for 13 years and won many titles, but he also has logged more coaching hours than almost anyone in the sport. 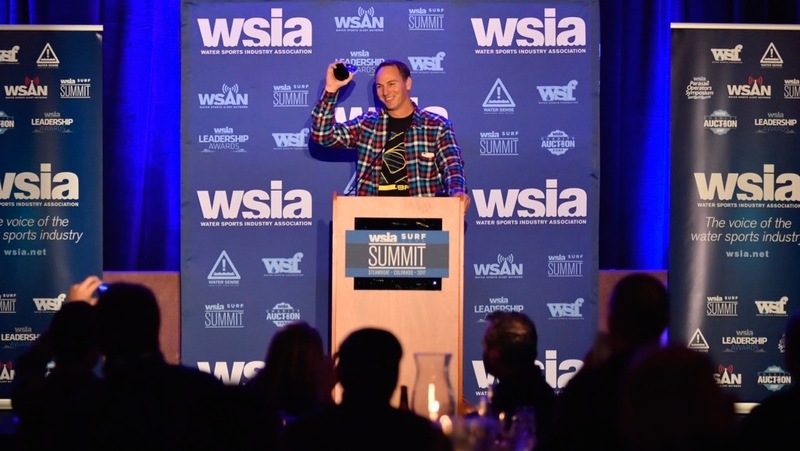 Longtime supporter and friend of the WSIA, Cobe accepted the award graciously, stating, “I have to thank my wife Tarah – she works so hard. We couldn’t do this without Pete at O’Brien; he’s been a support since day one. And the Malibu crew, we couldn’t do it without you.” Together, Cobe and Tarah have made a huge impact on the towed water sports industry and are sure to continue with their contributions for a long time. As an opening monologue for the following award, Jeff Barton recalled a conversation he had 15 years ago with Jim Emmons, former WSIA President, regarding the state of towed water sports and how to bring it to more people. “I remember Jim Emmons saying, ‘It’s going to be the wake parks, that’s how we’re going to do it!’” And here we are today, with the wake park market rapidly expanding and bringing towed water sports to the masses. 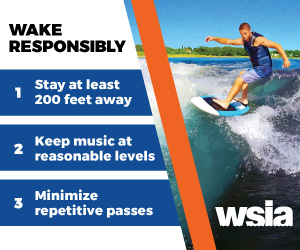 Wake parks help eliminate barriers to entry, and they are introducing an exponential amount of new people to the sports of wakeboarding, water skiing and more each year. The individuals and organizations within the community are responsible for helping the industry grow, and this award recognizes the park that has done the best with community outreach and promoting participation growth. 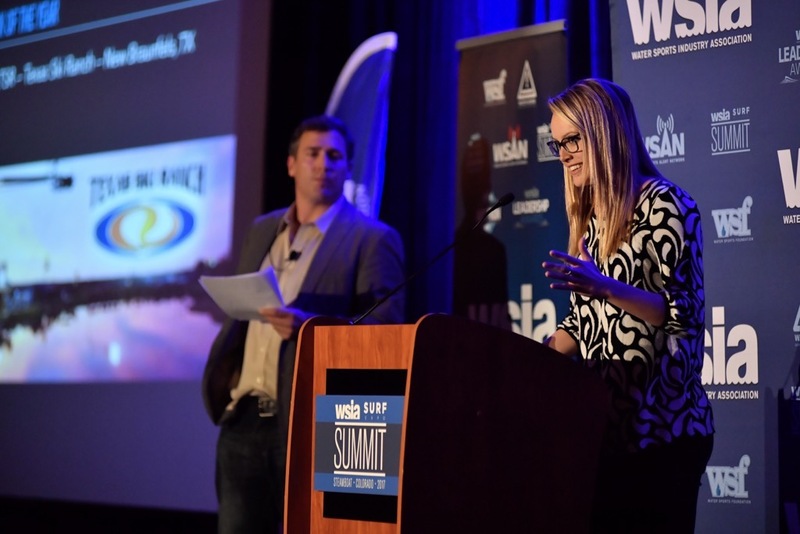 The WSIA was pleased to announce that Texas Ski Ranch (TSR) in New Braunfels, Texas, was the front-runner for this award. The acceptance speech by Morgen Burchell finished with a line that the entire crowd could relate to: “It’s the passion that brings us here, and it’s the passion that’s going to keep us in the sport.” It’s evident that the team at TSR loves what they do, and now it’s clear that everyone else loves what TSR does as well. Conceptualized three years ago, this award is one of the most anticipated and among the highest of honors in the entire industry. The Larry Meddock Award honors a person or group who has gone above and beyond to promote or grow the water sports community, not for their own financial gain, by volunteering, helping under privileged groups, or starting an organization that grows or promotes the sport. 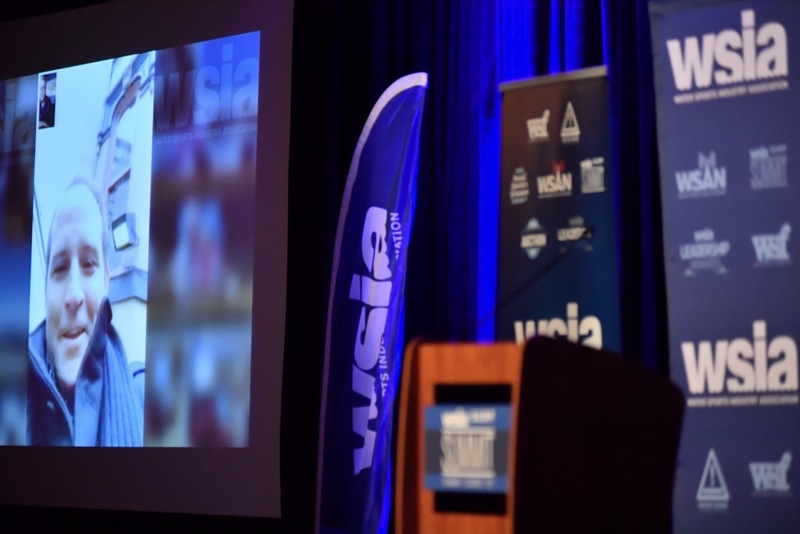 The deserving recipient of this year’s award was Zane Schwenk, an exceptional leader who has been involved in almost every aspect of the towed water sports world and whose professional career highlights are far too many to list. Most notably, Schwenk is the co-founder and current face of #PassTheHandle, a four-year-old worldwide initiative inspiring new participants to get on the water. Schwenk is relentlessly pushing to protect the towed water sports community and is a huge inspiration to the entire industry. Nominations for the next Leadership Awards begin in January of 2018. Anyone can nominate, only current WSIA members can vote. For any questions, e-mail info@wsia.net.